If any of this sounds familiar, then you’re in for a treat. 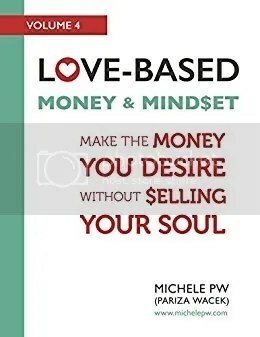 Love-Based Money and Mindset is designed to help you heal your relationship with money so you not only feel peaceful about it, but so you’re also able to attract all the abundance you want. Do you hate the way sales and marketing copy makes you feel? Sales-y? Inauthentic? Hype-y? Just plain icky? You’re not alone … and there’s a reason you feel that way. It’s because traditional sales and marketing copy (also known as direct response copy) sells by tapping into fear. But, you don’t have to use fear – you can sell and market your business using love instead. And when you do that, you stop manipulating and twisting arms to get buyers, and instead start attracting, inspiring and inviting your ideal clients into your business. Ahhh — doesn’t that sound wonderful? 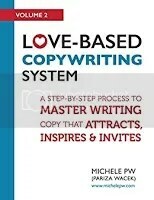 In this book, copywriting and marketing expert Michele PW (Pariza Wacek) teaches you the philosophy and the foundational principles behind selling with love versus fear – the same principles she’s used to help her clients build their businesses over the years. 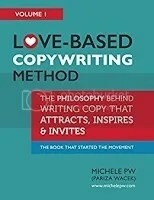 Plus, she includes dozens of exercises so you too can easily implement love-based copy in your own business. Whether you’re a seasoned entrepreneur or business owner or just starting out, you’ll discover valuable tips and strategies around selling and marketing with love. And not only will you feel great about it, so will your ideal clients. 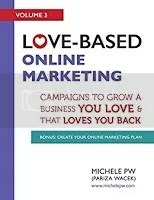 And the best part, thanks to the Assessment included in this book, your Online Marketing Plan will be based around your Marketing Love Factor. This means you’ll not only love your marketing (really! Even if you’ve always hated it before! ), but you’ll also be empowered to market your business in the exact, perfect way for you. Along with being a copywriter, she also writes novels (in fact, she just published her first two psychological thriller/suspense/mystery novels called “The Stolen Twin” and “Mirror Image'”) plus, she is also the author of the “Love-Based Copy” books, which are a part of the “Love-Based Business” series and cover both business and personal development. Charles and Anna soon discover that a dangerous Fae being is on the loose, replacing human children with simulacrum. The Fae’s cold war with humanity is about to heat up—and Charles and Anna are in the cross fire. DEAD HEAT is not a disappointment. Charles and Anna are great in this book. I love the storyline and the well-developed characters.Someone is taking children and leaving a changeling in its place. Now Charles and Anna are up against the clock to find the missing girl before she is killed. They find out that a Fae is doing this and must find the Fae before the children of his friend are in danger. Charles and Anna are a great couple. Charles also has to deal with the potential loss of a friend who is dying of cancer. This brings up memories of the time they were young and foolish. Anna also sees why Charles doesn’t want to have kids, but in the end he is willing to adopt. This is a great boo and recommend it to everyone. I give DEAD HEAT 5/5 stars. Here lately I seem to have lost my focus. I cannot focus on what I need to be doing, paying bills, writing my review, or just writing in general. I will sit at the computer and stare willing the words to appear on the screen, but nothing happens. I guess I have too many things going on around me to focus on any one task. I try to help with the house work while Mom Is taking care of my Grandmother now that she is home. Grandma still has a long way to go in her recovery, she still cannot walk yet or use her left arm, but she is getting feeling back. This says that the brain is trying to make new pathways and going around ny damage. The other day they say that she kicked her left leg, because something was bothering her and she kicked it off the bed. This was great news! Also I cannot seem to focus, because now I am seeing a cardiologist to find out what was causing my chest pains back in January, and February. I have to go in next week to do a nuclear stress test on Wednesday, and a sonogram on Thursday. Maybe we can get this resolved and I can focus on something else. Also work has been crazy, and my knee pain has been worse since I stepped wrong and popped it. I know things will fall into place and I will get back to writing posts more often, I just have to be patient and let it take its course. I guess I could also change my environment and go to the library, or Starbucks in Barnes & Nobles and write. Maybe that will jumpstart the writing juices. For now I will take it one step at a time and just write about random things, and write my reviews a few days after I read the book. So for now I will go to bed and let my brain rest. I will talk with you later. Comments Off on MY WRITING FOCUS HAS GONE ON VACATION! I hide in an enclosure made by trees that have fallen onto one another, making a space wide enough that I could hide in and not be seen. As the guardsmen slowly search the area, I pray to the Goddess that they do not find where I am hiding. If I can only make it to the caves, I will be a safe. “Search the whole area! She cannot have gone far, if we do not bring him someone back…..” The Guardsmen scans the area.”Someone will pay for our failure.” The Guardsmen dismount to search the area thoroughly, leaving nothing overlooked. The Guardsmen get closer to my hiding spot, thrusting their sword through the think brush around the base of the trees. Suddenly a sword tip rips through the top of my hiding place barely missing me. Another one comes through at a different angle, slicing my gambeson. I don’t make a sound, hoping the next one does not go through me. Nothing happens, and I hear them moving further away. I wait a little while longer, making sure that they won’t double back. I peek through the branches, checking to see if it was clear. No one is around and I quietly remove myself from my hiding place. I run towards the caves just on the other side of the clearing. I slowly approach the opening, calling out to whomever is on guard duty know it is me and not one of the guardsmen. “Sharra, you made it!” I am engulfed in a hug by my brother. “Yes, but we need to move deeper into the cave. There are Gaurdsmen on the other side of the clearing.” I keep my arm around him as I relay the news to him. “We were waiting for you, everyone else is deeper inside.” I follow him as he moves deeper inside the cave. The cave was actually an old abandoned mine, left behind after it’s riches had been taken from it. Calum and me explored every inch of this mine growing up hoping to find something that others had overlooked. “Yes, they are inside, helping with those that are hurt.” Calum ducks his head, barely missing the top of the entryway.